Daniel Golden discusses Spy Schools: How the CIA, FBI, and Foreign Intelligence Secretly Exploit America's Universities on CBS This Morning. “Daniel Golden brings his razor-sharp Pulitzer Prize-winning investigative skills to this woefully under-reported, yet critically-important aspect of intelligence. 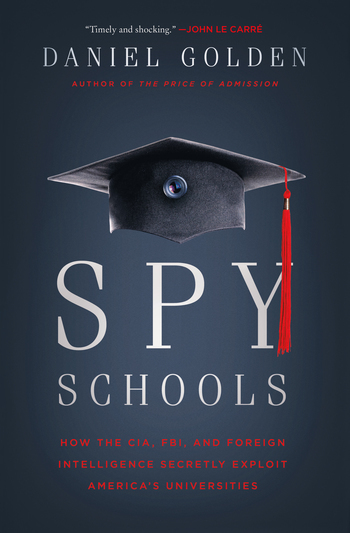 He takes us inside a program held over from the Cold War, where the stakes are high, but the costs to our civil liberties are higher.”—John Kiriakou, author of "The Reluctant Spy: My Secret Life in the CIA's War on Terror"
Daniel Golden won a Pulitzer Prize in 2004 for his Wall Street Journal series on admissions preferences at elite colleges, which became the basis for his bestselling book, The Price of Admission. He edited a series about how U.S. companies dodge taxes by moving their headquarters overseas, which won Bloomberg News’s first and only Pulitzer Prize in 2015. In 2011, he was named a finalist for the Pulitzer Prize for Public Service for his Bloomberg News series about for-profit colleges exploiting veterans, low-income students, and the homeless. He is currently a senior editor at ProPublica.